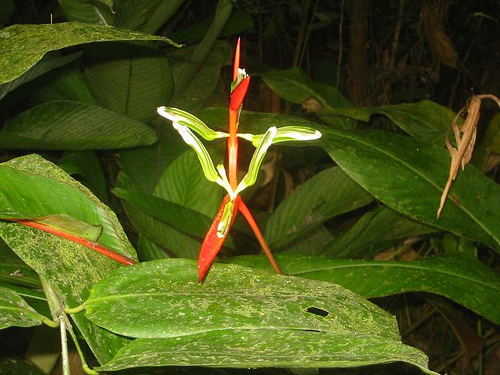 This is a photo of flower I saw in the rainforest around Kaieteur Falls in Guyana. It has garnered some popularity, having been nabbed (with no objections from me) for this website. Similarly, one of my photos of the White House, taken while I was living in DC, has been used in this online news story. Ahh, these are indeed the days of Web 2.0 and meta-news. I enjoy CBC radio exclusively for its excellent, seemingly objective news coverage. I don’t think CBC should be in the sports or entertainment business, and it certainly shouldn’t be spending tax dollars on recreating the music services of the private sector. For this reason, on long drives I tend to listen to the CBC’s long newscasts then turn the “dial” when its pompous we-tryin’-so-hard-to-be-hip shows, like DNTO, come on. On this weekend’s long drive to Peterborough, however, I accidentally caught two CBC entertainment shows that I enjoyed immensely: Go! and And Sometimes Y. The latter, hosted by my old acquaintance Russell Smith (which is not usually a selling point for me, as I do not like to hear familiar voices on the radio), is particularly good. So maybe I’ve had it all wrong from the start! Lastly, Sarah sends us this great video of the “Lost Seinfeld Episode”, the one in which Kramer hilariously uses the n-word.